A variety of companies and organizations require reliable data destruction. Financial institutions, educational institutions, government, military, medical, and other companies of all kinds require data destruction. 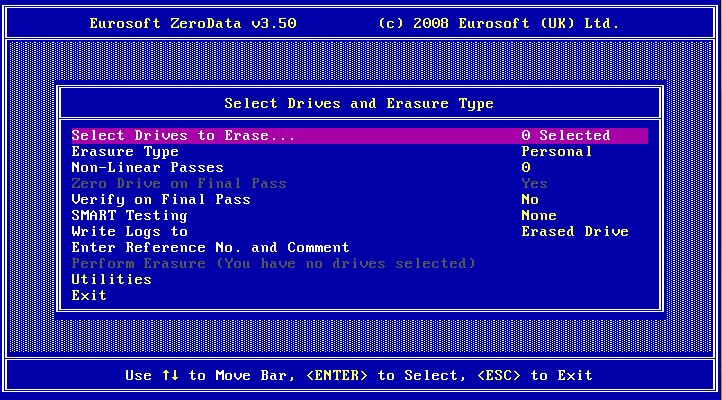 ZeroData hard drive eraser Is quick and easy-to-use. ZeroData boots up to an easy to use interface. ZeroData can be used to reliably erase hard drives without the need to physically remove the drive. This eases the maintenance burden for IT departments by facilitating quicker cleaning and re-loading of company workstations. In most cases, the data that needs to be permanently erased is sensitive. This sensitive data could be personal information from an employee file or private information from a medical file. This sensitive data could also be financial information such as credit and debit card account information. Would-be thieves may try to recover deleted financial data. ZeroData permanently destroys hard drive data so that it can never be retrieved. ZeroData hard drive eraser overwrites data stored in the master boot record and previously locked or hidden partition areas of the drive regardless of BIOS restrictions. These features ensure that all data on the hard drive is completely and permanently erased and cannot be recovered. It is always a good idea to verify that the drive has been erased; many companies require some form of verification. ZeroData hard drive eraser includes a S.M.A.R.T. log check feature to ensure the hard drive is functioning within specified norms before and after the drive is permanently erased. ZeroData™ also provides full reporting and HTML validation certificates. SATA and SSD drives are very common among workstation PCs and laptops. There are also several other types of hard drives that are used in servers and workstations. These server drives may contain vast amounts of sensitive data. Companies need a drive eraser tool that is compatible with all the hard drives in the organization. 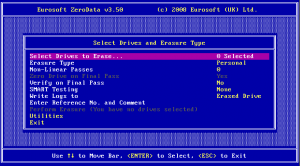 ZeroData hard drive eraser Supports RAID, SCSI, IDE, SSD and CHS hard drives.